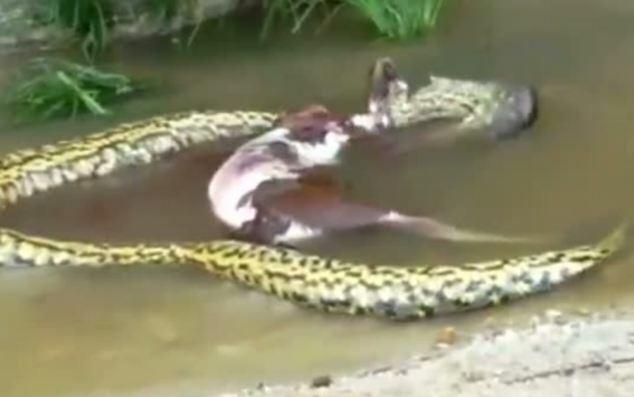 Watch this amazing bizarre footage of a huge anaconda snake regurgitating a cow that it had eaten earlier. This incredible footage shot in Brazil shows the anaconda, taking less than 2 minutes to bring back up its meal. Anacondas are the worlds largest aquatic snakes and on average grow to 18 to 20 feet long. Their normal diet is rats or Capybara. But they have been reported as trying to eat hippos and in Sri Lanka, even elephants. It is not known why the snake chose to regurgitate the cow but experts say that anacondas do vomit up their food if they have been disturbed and want to move more quickly. The Freaky wonders whether the snake is just suffering from body image issues and has bulimia!